Theme for the last few days – what to build next. 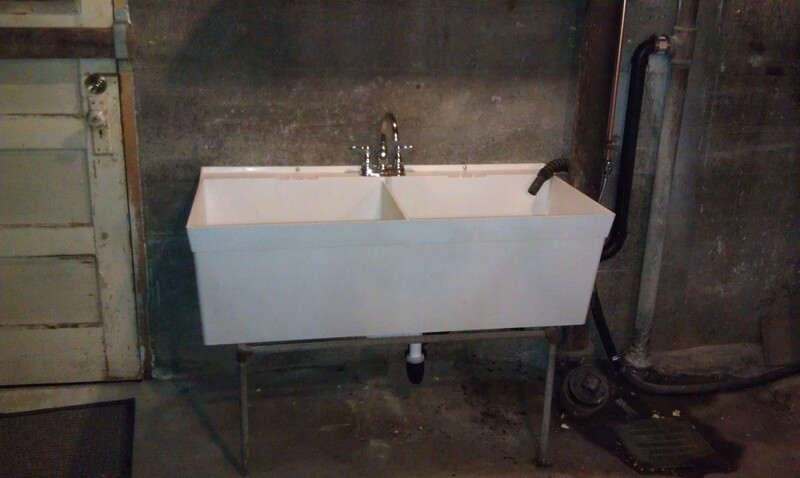 First up – a new laundry sink. The old sink was a good sink, except that everything leaked. We had a plumber coming to replace the old faucet with a much newer version. Then the sink plugged up during a washing machine cycle and I realized that the entire sink leaked at about the 1″ above the bottom point. Where there was a crack all the way around. So in the spirit of fixing things around the house we decided to get a new laundry tub. I ordered one and when it arrived managed to load it successfully into the STuBby car. Side note: This is the second time I have ordered through Home Depot where the box has been just beat to h#$l. The sink was OK, but I don’t know why they bothered to wrap it in cardboard. All I was supposed to do was put the legs on the sink, and the plumber would do the rest. 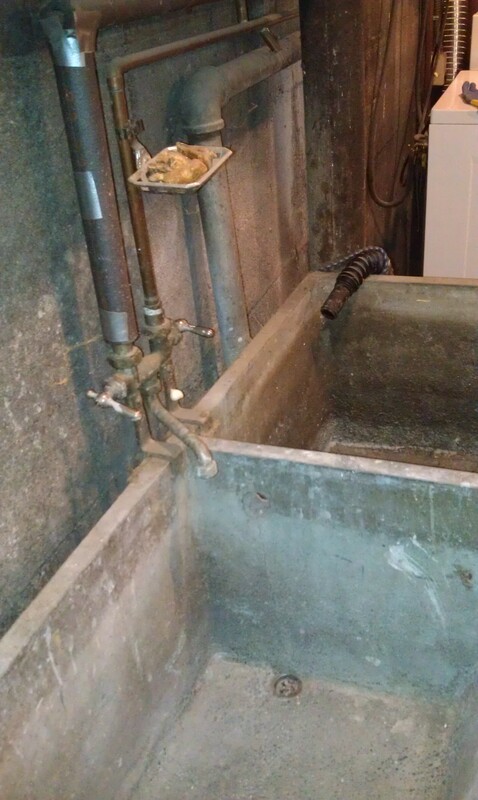 When I started to tackle this task I noted that the old sink was sitting on a base made of pipe that was firmly attached to the floor and wall. I know this could be taken apart with the correct tools, but I was not sure that was going to be the best alternative. So I did nothing, but make time to come home to be here when the plumber arrived. Of course – the plumber arrived early, and I arrived late. Who would have guessed that. He agreed that using the already level firmly attached base would be a good idea, and proceeded to do his magic. He rerouted the vent so he could attach the sink to the wall for a sturdier system. Nice work. 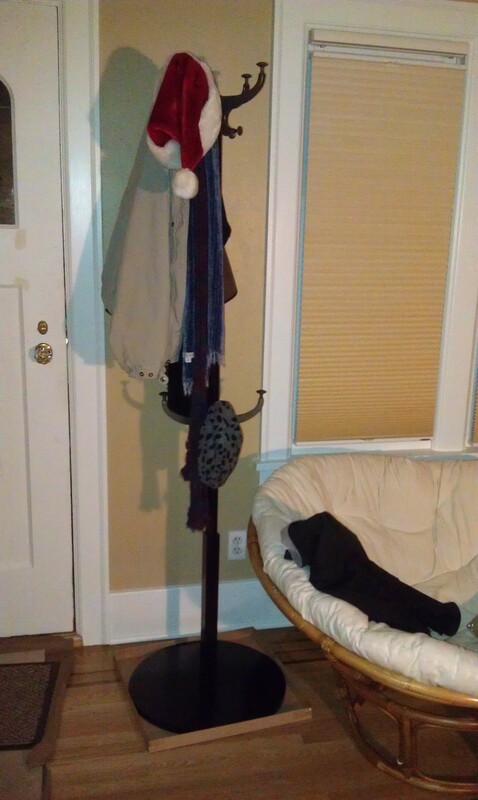 Since I couldn’t build a sink, I built a coat rack. Tonight our attention turned to the bed frame. This is because the NEW BED is arriving tomorrow. 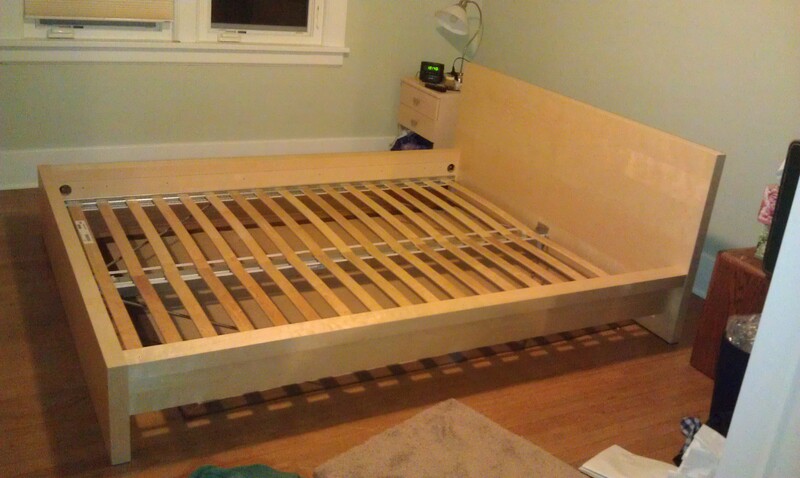 The frame was an IKEA product (of course), and the entire construction did not use an Allen wrench once. Not once. Instead it was all Phillips head screwdriver. And some screws that I honestly did not think would fit into their appointed place. We had to sort of pre-screw them in, back them out, and then do the attachment. Tonight is the last night on the air bed I believe. It has been a good substitute, but we are excited to have a real bed again. I was so sure of my ability to wield a tool, that I decided to replace the slides on the sticky drawer on our dresser. Unfortunately, the replacement slides I got from IKEA were not exactly like the old ones. Holes were not quite in the correct locations. So I am going to have to make one more trip to Renton, this time instead of just a picture I will have the slide I need to replace in hand. This entry was posted on December 6, 2013 at 12:50 am and is filed under Uncategorized. You can follow any responses to this entry through the RSS 2.0 feed. You can skip to the end and leave a response. Pinging is currently not allowed.